Republished May 12, 2015, 11:30 a.m., to correct an error in the text. Imports. Companies have also increased West Coast imports. However, because Asia is the closest global source of additional California-specification gasoline, it takes several weeks for resupply to reach the West Coast. 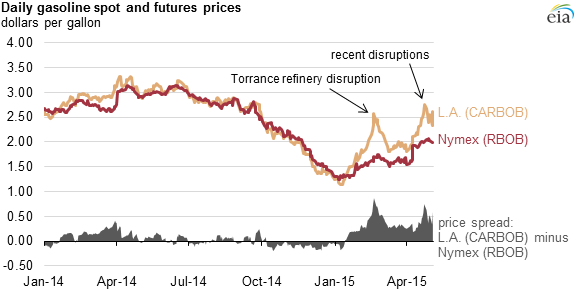 PADD 5 imported an average of 19,000 barrels per day (b/d) of motor gasoline in 2014, but approximately five weeks after the Torrance refinery disruption, PADD 5 imports of motor gasoline had increased to 143,000 b/d for the week ending March 27. PADD 5 has since continued to import motor gasoline above normal levels, with a four-week average of 49,000 b/d for the week ending May 1 helping to keep inventory levels stable. 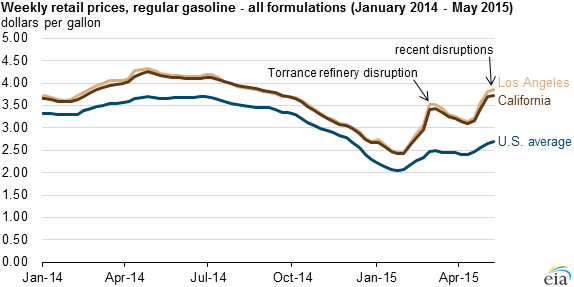 With imports accounting for a greater share of supply, recent disruptions and delays in shipments have contributed to wholesale and retail gasoline price increases.